Polka Dot Skirt: I've been obsessed with this skirt ever since I first saw it in Coast, and it's just too beautiful. I love the fact that they also do a version with a slightly shorter length, which is perfect for a shorty like me! Everything about it is stunning, I mean, come on, it's polka dots! Ombre Dress: This is pretty much the most beautiful goddess dress I've ever seen! Everything about it reminds me of a fairy or wood nymph and I can imagine it looking like such a show stopper at a Christmas party. Fur Collar Cardigan: Anything with faux fur on it is right up my street and considering this cardigan has fur and a blush pink tone to it, it's like it was designed for me. It looks so cosy and still keeps with my love of pastels even in the Autumn/Winter. Cat Bag: Who doesn't love a novelty bag?! This adorable little cat bag is absolutely perfect to go with any classic, simple outfit to add a touch of cuteness. I also love that it can be used as a clutch or a shoulder bag. Bow Jumper: As soon as I saw this jumper I knew I had to have it. Maybe it's a bit over the top, but I don't care. Anything with a giant bow on it is pretty much an essential for my wardrobe and it would go with so many things! 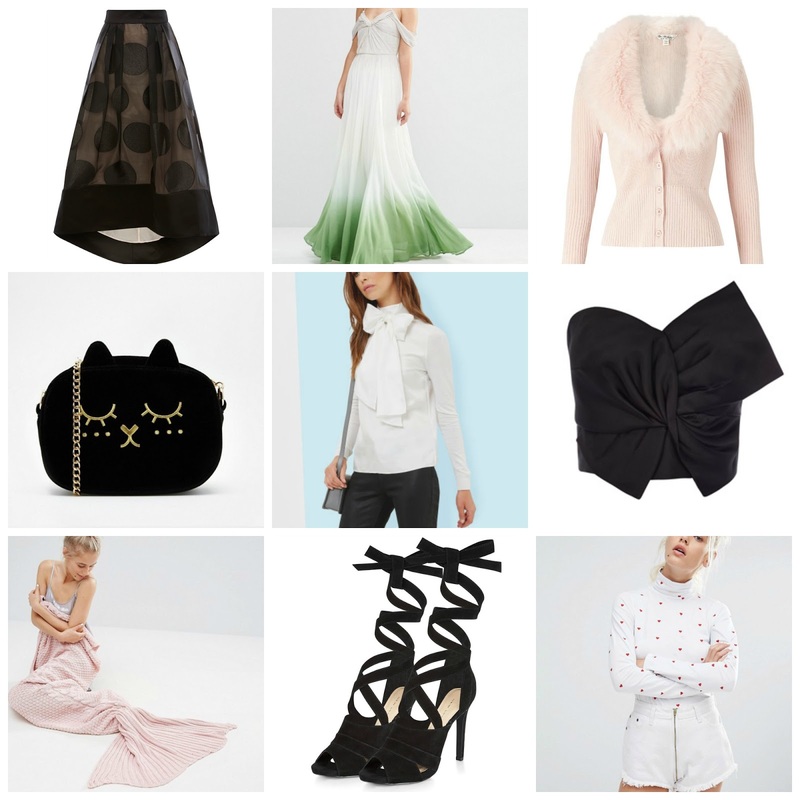 Black Bow Top: I feel like I accidentally went with a bit of a bow theme in this wishlist! I've been after this top for ages now because, as I said above, anything that's a giant bow is required in my life. I love that this top would go with so many things, especially my tulle skirts. Mermaid Blanket: You've probably seen this blanket floating around the internet already, but come on! It's INCREDIBLE. Of course I went with the pink one, but they actually do it in different colours which is fab. I 100% need this blanket to make me feel at least a tad more glamorous when I'm chilling on the sofa in my onesie eating chips. Heels: I love that these heels have a bit of a Halloween-come-ballet dancer look about them and would look fantastic with any Winter outfit. A pair of black heels always come in handy after all! Roll Neck Jumper: Lazy Oaf always nail it when it comes to adorable and different fashion, and this cute red heart jumper reminds me of a dress I used to have in school with this same print. It's so adorable and looks cosy as well. The perfect combo! This post was written in collaboration with Coast, but all opinions and style loves are my own.